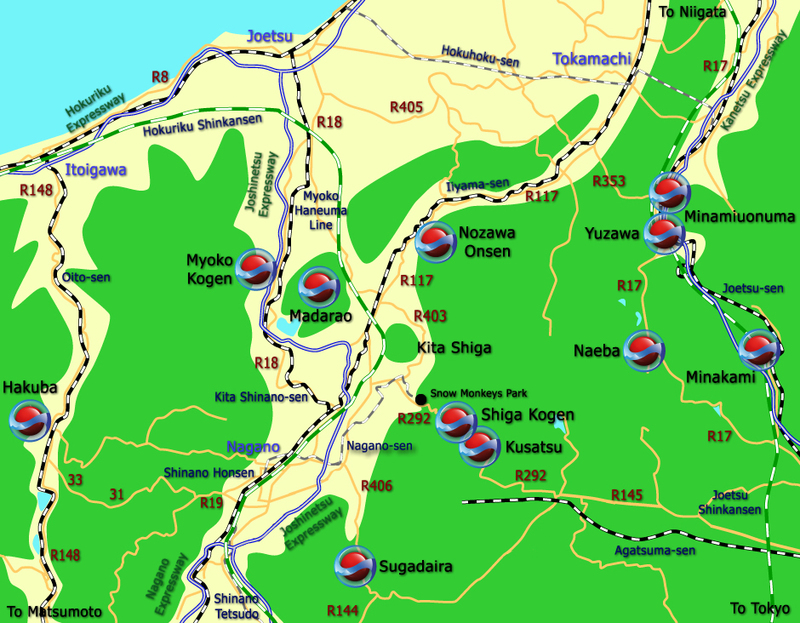 Shiga Kogen is a highland area to the east north east of Nagano City in the northern region of Nagano Prefecture. 'Shiga Kogen' is actually 19 (mostly) interconnected ski hills which share a common lift ticket. Shiga Kogen is also well known as being the nearest ski resort area to the snow monkey park at Jigokudani. The ski and snowboard resorts in the Shiga Kogen area are collectively known as 'Shiga Kogen' and they share a common lift ticket, but they each have their own name. See a full list of the resorts below. 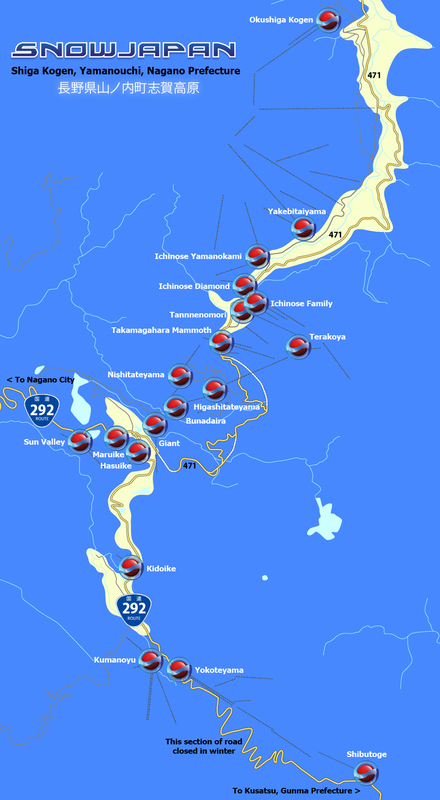 Most of the resorts in Shiga Kogen are interconnected. The resort areas in the south area - Kumanoyu, Yokoteyama, Shibutoge and Kidoike - are seperate from the rest. A free shuttle bus connects all of the areas. There is no station in the highland Shiga Kogen area. The nearest train station is Yudanaka Station on the Nagano-sen local train line. However many people take a bus direct from Nagano Station after using the Hokuriku Shinkansen. Take the Hokuriku Shinkansen from Tokyo Station to Nagano Station. Take the Tokaido Shinkansen to Nagoya Station. From Nagoya Station take the Chuo Honsen which goes to Nagano Station. From Nagano Station Zenkoji Exit change to the private Nagano-sen train line which to Yudanaka Station. Buses are available from Yudanaka Station to the Shiga Kogen resort areas. This journey is around 255km and usually takes around 150 minutes. This journey is around 285km and usually takes around 260 minutes. Local bus services are available from Yudanaka Station. The journey to the Hasuike area of Shiga Kogen from Yudanaka Station takes about 35 minutes. There is also a direct bus to Shiga Kogen from the East Exit of Nagano Station. The journey from Nagano Station to Shiga Kogen typically takes at least 70 minutes. A winter season shuttle bus operates within the Shiga Kogen area during the daytime and is free to use for people with valid ski lift tickets. Note that not all trains stop at all of the stations on the Nagano-sen train line. The limited express trains stop at as little as 6 stations. However all trains do stop at the Yudanaka terminal. Nagano-sen from Yudanaka Station to Nagano Station. Hokuriku Shinkansen from Nagano Station to Iiyama Station. Madarao Kogen is about 11km from Iiyama Station by bus or taxi. Nagano-sen from Yudanaka Station to Shinano Yoshida Station. Walk over to Kita Nagano Station (10 minutes). Kita Shinano-sen from Kita Nagano Station to Myoko Kogen Station. Bus or taxi from Myoko Kogen Station to the resorts. Hokuriku Shinkansen from Nagano Station to Ueda Station. Sugadaira is around 40 minutes from Ueda Station by bus or taxi. Hokuriku Shinkansen from Nagano Station to Itoigawa Station. Bus or taxi from Hakuba Station to the resorts. Nagano-sen line from Yudanaka Station to Nagano Station. Hokuriku Shinkansen from Nagano Station to Takasaki Station. Joetsu Shinkansen from Takasaki Station to Echigo Yuzawa Station. Bus or taxi from Echigo Yuzawa Station to the resorts. The Jigokudani Yaenkoen 'Snow Monkey Park' opened in 1964 and since then people from around the world have visited the park to observe the lifestyle of the Japanese Macaque....mainly the way they enjoy soaking in the onsen hot springs. The Japanese Macaque is a monkey species native to northern Japan, and is the most northern-living non-human primate, surviving winter temperatures of below -15 °C. They have brown-gray fur, a red face, hands and bottom, and a short tail - and often seem remarkably human like. Jigokudani (which actually means 'Hell's Valley') Yaenkoen is located a short distance off Route 292 in Yamanouchi town and about 10km from the nearest ski area in Shiga Kogen (Sun Valley). For detailed information on how to get to Shiga Kogen by car, please go to this section.